EDINBURGH, Scotland, 2018-Jun-25 — /Travel PR News/ — A local company has achieved VisitScotland’s top quality assurance award to become one of only two five-star tours operating in Perthshire. Sleepy Sporran Tours, which is run by Trish Simpson and Ian Bell, offers luxury small group tours around Scotland, showcasing some of the country’s most beautiful scenery and wildlife. Following a VisitScotland Quality Assurance visit, the business was praised for its hospitality and efficiency, ensuring visitors can enjoy a high quality experience. From woody walks and whisky to modern marvels and historic houses, Sleepy Sporran Tours offers a range of tours covering regions such as Perthshire, Fife and Angus. Owners Trish Simpson and Ian Bell have spent several years researching the local area, discovering hidden gems and planning routes that offer their visitors a different taste of what Scotland has to offer. As a result of their efforts, Sleepy Sporran Tours is now starting to see an increase in international visitors from America, Asia and Australia. As well as obtaining a five-star grading, Sleepy Sporran Tours has also achieved a VisitScotland’s Taste Our Best award for the use and promotion of Scottish produce in its ‘legendary’ Sleepy Sporran Picnic lunch, including eggs from their own flock in Blairgowrie and meat sourced from a family butcher in the same Perthshire town. 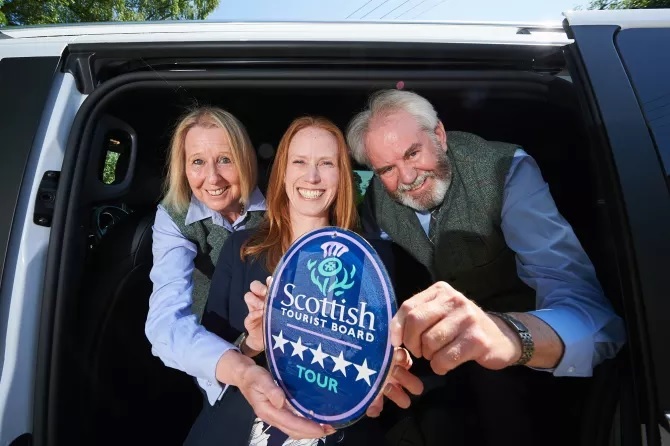 Caroline Warburton, VisitScotland Regional Leadership Director said: “My congratulations go to Trish and Ian at Sleepy Sporran Tours on the outstanding achievement of a five-star grading and Taste Our Best. It is well deserved recognition of their hard work to create a memorable experience for each and every one of their guests. These awards are a clear indication to visitors that they can expect the highest quality of service and standards. This entry was posted in Attractions, Tour Operators, Tourism, Travel, Travel Awards, Travel Services, Travelers and tagged Caroline Warburton, Ian Bell, Perthshire, Sleepy Sporran Tours, Trish Simpson, VisitScotland. Bookmark the permalink.